A passionate and outspoken activist from Durban has won the prestigious Goldman Environmental Prize. Desmond D'Sa, an environmental hero with an unfailing commitment to environmental justice and environmental rights for all, has changed his entire community. Despite fire bombings and attempted shady business deal buy-outs, he stands firmly by his desire for justice and equality. D'Sa fights tirelessly to defend the rights of the poor, who are worst affected by environmental injustices. And for this he received the Goldman Environmental Prize for Outstanding Environmental Achievement in Africa on 28 April, in the United States. Forcibly removed by the apartheid government from their home, the D'Sa family was resettled in South Durban, an area with no parks but plenty of large oil refineries, chemical tank farms and paper mills. The young D'Sa quickly realised that corporate pollution was killing people; seeing his neighbours and family members suffer dreadful ailments he realised that something had to change drastically. His first impression of South Durban was shocking, he says. "To see so many smoke chimneys and factories located alongside residential housing and kids playing in the plumes of the pollution. In this urban jungle there were no clean running rivers, no vegetable gardens and only red soil. As the years went by, there was a rapid increase in industry and petrochemical expansion. "This made me realise we were deliberately placed to live alongside dirty industries and our lungs played the role of purifiers for pollution from these factories." Regular visits of the government ambulances became more frequent – and they would come with nebulisers and oxygen cylinders to ensure that people, especially children, were able to breathe properly. It got worse, and D'Sa and his friends were unable to play outside, driven indoors by the rank air from the factories. Crops could not be grown, and people had to buy all their fruit and vegetables, taking a further financial toll on the poor community. D'Sa vowed to change the life of his community. 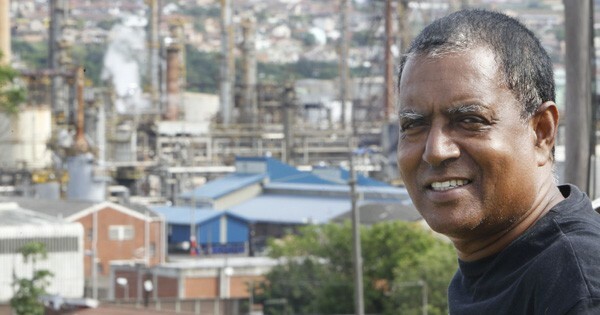 In 1990, he co-founded the South Durban Community Environmental Alliance (SDCEA), which unites a diverse group of South Africans with an ultimate goal of environmental justice for all. By 1996, he was tirelessly campaigning against toxic waste dumping in South Durban, a poor but highly industrialised area. A California non-profit group called Global Community Monitor partnered with local residents and D'Sa to expose the detrimental reality of the air pollution and the illnesses that were abundant in the area. A "bucket brigade" of residents collected samples of air, which were then sent to the US where they were analysed. They showed high levels of benzene, a confirmed carcinogen, and several health studies found incidence of asthma in 52% of the children and a quantified cancer risk at 25 in 100 000 people, compared with the norm of 1 in 100 000. "When we got the results back, we developed a flow chart of all the different smells and odours so that people could be better educated about the chemical odours and the impact they would have on health," says D'Sa. After relentless campaigning, the dump was closed. But as a result of his passion, in 2011 his home was firebombed. Speaking to the Washington Post, he said: "We face dangers all the time because we stand up for justice and truth and for people who can't speak for themselves. But that will not deter me from doing what's right. I'm not going to be afraid. "The attack resulted in me and my daughter being rushed to hospital. I endured facial injuries and burns to my arms as well as respiratory difficulties. The attack changed me in a way where I became stronger, more confident to speak the truth and not be afraid as I knew that I was doing the right thing." About his choice as winner, David Gordon, the executive director of the Goldman prize, said: "He really stood out for his passionate activism and the way he's organised his community to achieve a really important victory." The Goldman award highlights the SDCEA's 2011 struggle and victory in getting Wasteman Holding's Bulbul Drive toxic landfill site, which was exposing residents to dangerous chemicals, shut down. 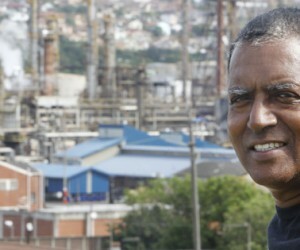 South Durban is home to almost 70% of South Africa's industry, including more than 300 oil and gas refineries, paper mills, agrochemical plants and hazardous waste landfills such as the Bulbul Drive dump. For more than two decades, Wasteman Holdings, a South African waste management company, dumped toxic waste from shipyards, factory farms, medical facilities, and oil and chemical factories in the Bulbul Drive landfill, contaminating soil, water and air. The community spent nearly 15 years fighting it, and turned an application for expansion in 2009 to a closure in 2011. Still, the shutdown is just the first step. The landfill's leachate – the liquid that runs off the waste – is so toxic that other disposal sites won't take it. The government has instructed Wasteman to build an onsite plant, to pretreat it before shipping it elsewhere. Paying tribute to South Durban residents, D'Sa says: "The closing of the Bulbul Drive landfill is a remarkable triumph and a deserving victory for the hundreds of tenacious and brave residents who campaigned tirelessly for years to close down the landfill." And he is over the moon at being awarded "the Nobel Prize for grassroots environmentalism". The SDCEA embraces a holistic approach, with an ideal of achieving environmental justice for all. It focuses on water and land issues, basic human rights, all types of pollution, and resisting toxic industrial expansion, development and infrastructure projects that seek to destroy the community. The group challenges policy and legislation, builds education and awareness, and community empowerment. D'Sa seeks out environmental justice, explaining: "This is about equity and justice as well as basic human rights while living in harmony with nature and other species. It is about those with power – the politicians as well as the corporations – abusing the poor. "Today in South Africa I see the increase of injustices and inequality towards people and the environment and the way in which we all interact with the built environment as well. What is noticeable to me is the destruction of our social systems, ecosystems, flora and fauna as well as many other aspects of the world we live in. As a result of this inequality – together with Brazil, South Africa is the most unequal country in the world, where the gap between the richest and poorest is the greatest – the level of poverty is rising, and there is a general lack of access to basic needs such as water, energy, housing and proper sanitation." With the increase in industry and toxic emissions, he says, the level of health concerns escalated to an extent that the community realised they needed to take a stand and fight for their rights to an environment that was not harmful to their health and well-being. "For me it was more than just a stand; it was to bring to the attention of all community members, [the] government, and huge corporations that corporate polluting activities – condoned by [the] government – are killing us, the residents of South Durban, daily." Still fearlessly fighting, D'Sa has great plans in the pipeline. He is contending a proposal to expand the port of Durban that would shift and misplace thousands of South Durban residents and exacerbate waste, pollution and traffic in the neighbourhood. "[The government] wants to develop a dug-out port which will result in some of us losing our homes. We are losing our social fabric and our urban neighbourhoods are changing from residential to peripheral industrial wastelands," he explains. The major infrastructure development of the dug-out port will be backed by the Infrastructure Development legislation which basically gives the government the right to do as it pleases, for the "good of the nation" and elite corporate wealth. This is the SDCEA's focus over the near future. "[The expansion] will cause the biggest social upheaval since apartheid. We already suffered enough trauma under apartheid; we lost our lands, our houses, our communities. We don't want to go through that again," says D'Sa, who has vowed to fight the plan at every step. It was a foreboding echo of history, said Global Community Monitor executive director Denny Larson, "as corporate and other forces legally and forcibly evict people from land where they've been living for a long time. It would be the largest removal of residents – many subsistence fisher folk – since apartheid." Established in 1989 by late San Francisco civic leaders and philanthropists Richard and Rhoda Goldman, the Goldman Environmental Prize annually honours grassroots women and men from inner cities or remote villages who make significant efforts to protect and enhance the natural environment, often taking personal risks. The winners receive $175 000 (about R1.8-million) and a bronze sculpture called the Ouroboros that depicts a serpent biting its tail, a symbol of nature's power of renewal in many cultures. There are two ceremonies: first, in San Francisco at the War Memorial Opera House. Over 3 000 people attend the always packed, emotion-filled event. Later that week, prize recipients attend the second ceremony in Washington DC. At the ceremonies, short documentary films provide an introduction to the recipients and their accomplishments. Other winners this year include the Indonesian biologist Rudi Putra, who dismantled illegal palm oil plantations causing deforestation; Russian zoologist Suren Gazaryan, who exposed government corruption and the illegal use of federally protected forestland along Russia's Black Sea coast; Ruth Buendia from Peru, who stood up to dam construction that would have uprooted indigenous people; the American attorney Helen Slottje, who provided pro-bono legal assistance to defend many towns targeted by gas drilling operations; and Ramesh Agrawal from India who, from his small internet café, began a successful campaign to stop a huge coal mining project in an area already affected by pollution.